The quilt renovation is done! 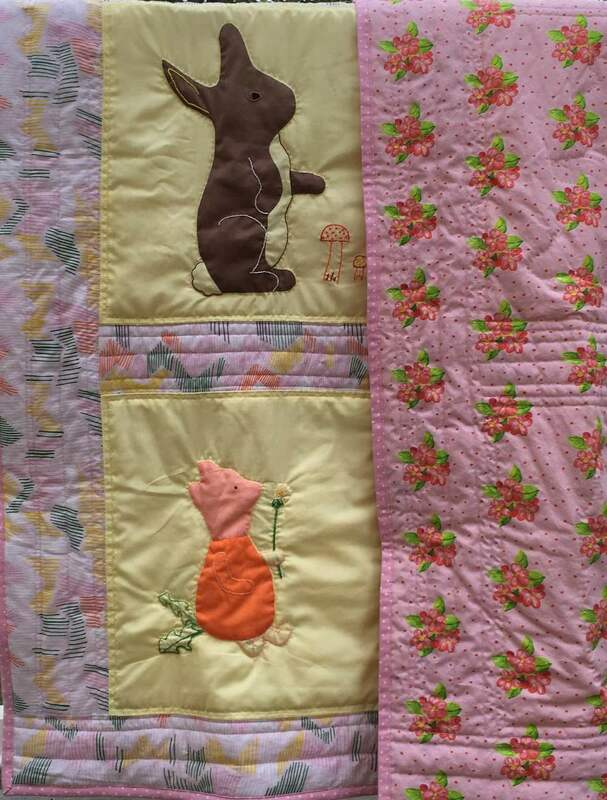 The Winne-the-Pooh baby quilt I made in the mid 1970s is pictured on the left, and the 2016 renovation on the right! The backing is my "Apple Blossoms and Dots Pink" fabric printed by Spoonflower.com. I wasn't sure it would be possible to remake this quilt, but it turned out to be totally do-able. I was able deconstruct the old quilt because I had done a minimal amount of hand stitched quilting. I did need to un-sew the inner machine sewn seams between the blocks and sashing but that wasn't difficult. (See my last post for more about this project). On the renovated quilt, I machine quilted the sashing and then hand quilted around the appliques just as there were quilted originally. I'm really pleased with this "new" quilt. It now is in great shape and can be enjoyed by the next generation of children!